By The Numbers will highlight the Red Wings on-ice accomplishments in the 2015-16 season. Each week during the off-season, By The Numbers will profile a different player on the team, focusing on their statistical highs. This week we focus on defenseman Kyle Quincey. Kyle Quincey will become an unrestricted free agent on July 1. Originally the Red Wings' fourth-round draft pick, 132nd overall, in the 2003 NHL draft, Quincey returned to the Wings in 2011-12 at the trade deadline after one season with the Los Angeles Kings and nearly three with the Colorado Avalanche. Quincey, 30, has dealt with contract uncertainty before, but it's not the easiest part of being a hockey player. "A lot of people don’t know that side of the job," Quincey said. "Packing up a house and not knowing where you’re gonna be. You’ve got family that need to know where they’re gonna be, and when you have no answers for them, it’s kind of the (crappy) part of the job, I guess. The uncertainly. If Kenny (Holland) offers me something, I’d love to come back. We love it here. But if not, July 1 and just see what happens." 35 | Quincey, who had offseason surgery on his left ankle, missed 35 games when he had to have similar surgery on his right ankle in November. Quincey was one of only three Wings who missed more than 20 games, joining Drew Miller (54 games) and Johan Franzen (80 games). 495 | Had Quincey not missed so many games after ankle surgery, he would have hit the 500-game milestone. Instead, Quincey finished the season at 495 career games played. 8 | Quincey blocked eight shots on April 2 at Toronto, a new career high, and the highest one-game total for any Wing this season. Quincey's previous high was six blocked shots. Quincey also scored the game-winning goal in that game. 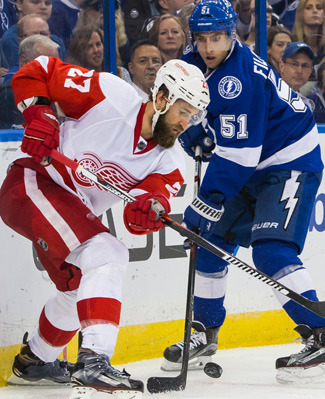 7 | Quincey did most of his damage against the Atlantic Division this season. He had two goals and five assists in 18 games within the division. He had two goals and two assists in 16 games against the Metropolitan Division. 2 | For the first time in seven seasons Quincey was credited with scoring multiple game-winning goals. His two goals – against the New York Islanders (Feb. 6) and Toronto (Apr. 2) – equaled his single-season high that he established during the 2008-09 season when he was a member of the Los Angeles Kings. 2 | Only two players in franchise history have a last name that starts with the letter Q, both defensemen. Aside from Quincey, Bill Quackenbush played his entire career for the Wings from 1942-49. DetroitRedWings.com managing editor Bill Roose contributed to this report.